Any public policy coming out of a government body should be looked at with skepticism. Most of the time, the said policy is either based on shaky foundations, done to satisfy lobbies or has an agenda that has nothing to do with public welfare (if such a thing exists). 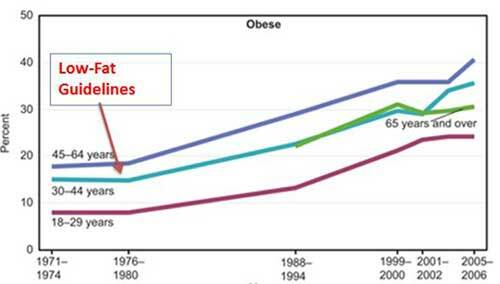 Yes, that’s right: Obesity has skyrocketed since government issued its low-fat, high carb recommendations. 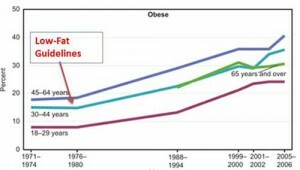 Even when we take into consideration the arbitrariness of obesity and overweightedness, these figures shouldn’t be a surprise considering the faulty government recommendations and the numerous studies showing that high-fat, low-carb diets are much better to lose weight and maintain a good overall health. How can that be? It’s simple body chemistry. When you eat carbs, your body needs to get rid of it quickly as too much of it is poison. It doesn’t matter if it comes from candy, an apple or starch – the latter is just a long chain of simple sugar, so its end effect on the body is the same. Insulin helps assimilate sugar and store it temporarily. People with type-2 diabetes have eaten so much sugar that their body can’t produce enough insulin to control blood sugar. But if they switch to a low-carb diet, that can be reversed. Switching from carbs to fat now. Decreasing intake of the latter (especially in the saturated form) is detrimental to the body. Indeed, it’s used to produce testosterone, the male hormone (women have it, too, but much less). Considering that testosterone production decreases after age 30, it shouldn’t be a surprise that lower fat intake can lead to erectile dysfunction. Besides, the “lipid hypothesis” – high fat intake leading to higher rates of heart diseases – seems to have used the same science that climate hysterics have used. Indeed, if there ever was a correlation high fat/high rates of heart diseases, it was a rather weak one. So like climate “scientists”, nutritional scientists simply dismissed the data that didn’t fit the conclusion. Which is why the “French paradox” isn’t one at all: they have fewer heart diseases exacty because they eat more fat. In fact, there is a negative correlation between fat intake and heart diseases. This fear of saturated fats has lead the industry to seek alternatives, which have proven lethal. First, there are trans fats, found in “hydrogenated” of “modified” oils. This way, the fat would have the same texture as saturated fat without the so-called bad components. Just one problem: the solid texture the hydrogenation process gives to fat keeps existing in our bodies. In other words, it clogs your arteries and makes you a target for heart disease. It also lead the industry to seek unsaturated fats. They are good if they come from natural sources like olives, nuts or avocadoes. But if they come from… unusual sources like corn and canola (which have virtually no fat in them), they increase omega-6 fatty acids which are link to inflammation. I see it with my mother-in-law; she gets excrutiating arthritis pain whenever she eats meat – modern U.S. beef is basically stuffed with corn. In other words, trusting your nutrition to government is like trusting a teenager with car keys and a bottle of whiskey. The former has enacted suggestions based on evidence as solid as alchemy. It’s maintained because of all the entrenched interests created with such policies.